Visitors to the mountain towns of Jackson County, NC. are getting revved up for the fall season! October is right around the corner, and the county is gearing up for two spectacular displays of classic cars. 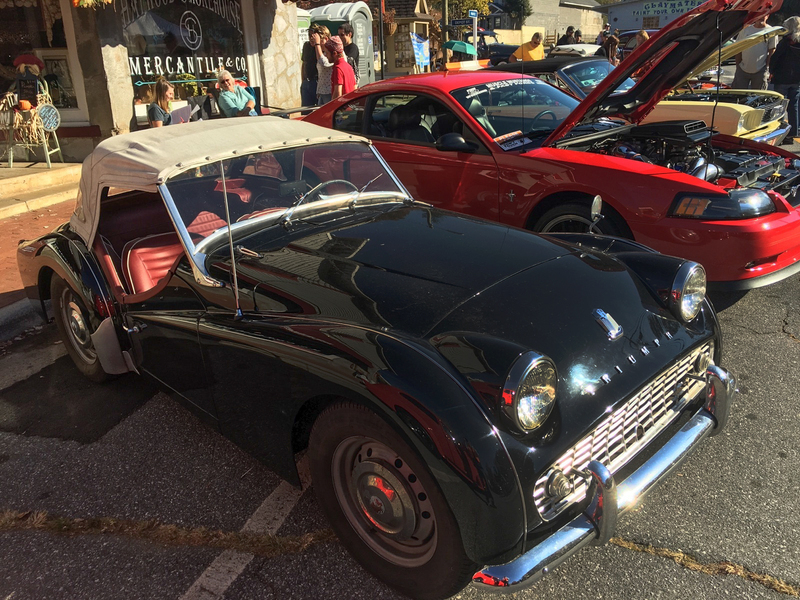 The annual Cruise-In at Sylva Plaza will take place Sunday, Oct. 1, and closing out the fall car season will be the Spirit of the Smokies Car Show, set for Saturday, Oct. 28, in Dillsboro. The Sunday, Oct. 1, Cruise-In will include classic cars (1987 and older), current-day muscle cars and “rat rods” (custom creations designed to express the builder’s take on a retro junk vehicle), as well as music and food. It pays tribute to the old Rebel Restaurant, a busy destination during the dozen or so years it operated. Located in front of what’s now Sav-Mor, the Rebel (1960-1972) offered breakfast, lunch and dinner but is best remembered as the place local teens went to see and be seen. The event’s $20 car registration fees, $20 T-shirt donations, food and beverage sales, and 50-50 raffle will raise money to help cover Jackson County Genealogical Society operating costs. This year’s Cruise-In fundraiser for the Jackson County Genealogical Society is set for this Sunday, Oct. 1, from 1 until 4 p.m. at Sylva Plaza. The event pays tribute to the old Rebel Restaurant, which operated in what is now the Sav-Mor parking lot from 1960 until 1972. Owners of classic cars (1987 and older), current-day muscle cars and “rat rods” may participate for a $20 registration fee, which allows them to drive in the day’s law-enforcement escorted cruise through Sylva and Dillsboro that will begin at 4 p.m.
Cars will be on display from 1 until 4 p.m., when they will depart the Sav-Mor parking lot for the parade. A law-enforcement escorted cruise through Sylva and Dillsboro, led by Sheriff Chip Hall in a vintage police car, makes this event unique among other regional car shows. It is estimated that the cars will reach the downtown Sylva business district around 4:15 p.m. for those who would like to catch the parade. Every penny of the money raised at the Oct. 1 event will benefit the JCGS, which has worked since its 1991 founding to bring together individuals interested in genealogy; to discover, research and exchange materials related to Jackson County genealogy; and to publish genealogical information on a regular basis. For information on the Society, visit the JCGS on Facebook; or call 828-631-2646; email; or find the Society online at http://www.jcgsnc.org. The 19th annual Spirit of the Smokies Car Show will take place Saturday, Oct. 28, from 10 a.m. until 3 p.m. on Front Street in Dillsboro. The show is sponsored by the Sylva Rotary Club with the Smoky Mountain Cruisers and all proceeds will benefit local non-profit organizations. Last year’s event had more than 100 participants, with vehicles coming from Western North Carolina, North Georgia, and East Tennessee. Categories include: Classic Cars, Motorcycles, Special Interest Vehicles, Modified Street Machines, Trucks, Street Rods and Farm Equipment. Trophies will be awarded to each category winner. Registration on Oct. 28 begins at 9 a.m. For information on how to register, you can visit the Sylva Rotary Club’s website.